On view at Pavilion on afternoon and evening of sale, and at Shop during the one week prior to sale (see details later). Lots 147-325 Lots by country A-Z, excluding U.K.
Stamps and Collectables Auction, 1 February 2016 Page 2 Estimate. Viewing times and shop hours are listed on page 19.
countries. (Many 100s) þ .. .. .. .. .. £180. many countries and all periods. Many useful items. Quality varies, but many are good/fine. S.t.c.£3,400 (100s) þ .. .. .. .. .. £120. etc. (Many 1,000s) þ .. .. .. .. .. £100. China (c.200), etc. Also stockbook of mainly UK pre-decimal mint commems. (100s) þ 70.
on/off-paper, etc. (1,000s) þ .. .. .. .. .. 60.
stamps. Also album pages, three files of sheets, etc. (1,000s) þ .. .. 60.
albums inc. some empties, on/off-paper stamps, covers, etc. (1,000s) þ .. 60.
wholesale material with a catalogue price of £1,030. þ .. .. .. 60. 9 Similar box, this one again with a wholesale batch similar to the previous lot (cat.£980). þ 60. 10 Similar box, this one including a few old Buy or Bid lots with an upset price of £80. þ 50. 11 Similar box, this one with a bundle of Australian presentation packs (c.33) þ .. 50.
some covers, etc. (1,000s) þ .. .. .. .. .. 50.
album and loose. (1,000s) Also three albums of mainly modern postcards. þ .. 50.
books from 1980s. (100s of stamps) þ .. .. .. .. 50. 15 Binder of unsold items from a club’s “Bring & Buy” sale, much Commonwealth and Europe. Stated to catalogue £3,500, PTSA £420. Mixed condition. (100s) þ .. .. 50.
royalty, railway, etc. ), a few mint UK, plus a mix of cigarette cards, etc. þ .. 45. Rhodesia 1970, Sierra Leone 1972, and Sudan 1951 Official. S.t.c.£250. (136) .. 45.
of UK FDCs, 2 albums of UK PHQs, locos album, etc. [NB carries tobacco smell] þ 40. UK. (1,000s) þ .. .. .. .. .. .. 40. (c.280), world on stockcards, etc. (Many 100s) þ .. .. .. 40. The V symbol shows that the lot will not be taken to the auction venue, and has to be collected from us. Stamps and Collectables Auction, 1 February 2016 Page 3 Estimate. wealth and Europe. S.t.c.£2,140, PTSA £302, mixed condition. (100s) þ .. 40. Elvis). þ .. .. .. .. .. .. 40.
etc. Also some covers. (1,000s) þ .. .. .. .. 40.
omnibus values of 1935, 1937, 1946, 1949, South Africa, Czechoslovakia unused p.stat. postcards, labels, etc. (100s) þ .. .. .. .. .. 40.
into tins, envelopes, etc. (1,000s) þ .. .. .. .. 40.
hundred stamps, but the album in good condition. þ .. .. .. 35.
modern world postcards (c.250), and envelopes of world stamps off-paper. þ 30. 28 Carton of mixed world material – many on pages, plus loose, a few covers, etc. (1,000s) þ 30.
commems 1953-2002, etc. (1,000s) þ .. .. .. .. 30.
album of foreign. (Many 100s) þ .. .. .. .. 30.
stuck. Also binder of covers and loose. (1,000s) þ .. .. .. 30. 33 Box with world stamps on/off-paper partly sorted by country in boxes, tins, envelopes, etc. Also some junior albums. (1,000s) þ .. .. .. .. 30.
album of Channel Is./IoM FDCs, other mainly UK covers and postcards. (100s) þ 30. 35 Album with mainly used world colln. from countries I-Z, much 1960s. (c.2,400) þ 30.
some Denmark, Channel Is., I.o.M., Philatector watermark detector, etc. (100s) þ 30. UK. (100s) þ .. .. .. .. .. .. 30.
range of countries and periods. (Many 100s) þ .. .. .. 26. Spadger’s Monster Collection of Spoofs set (36) in contemporary stick-in album. þ 26. 40 Box with three junior collections, stockbook of world (much UK), three jotters of dupl. mainly UK, some covers, etc. (100s) þ .. .. .. .. 24. 41 Box with a stockbook of Sweden and Greenland, world on/off-paper, album pages, etc. þ 20. 42 Two shoeboxes of world stamps in envelopes, stockcards, etc, some postcards. (1,000s) þ 20. 43 Biscuit tin containing some thousands of mainly off-paper world stamps. þ .. 20. 44 Stockbook of stamps in fourblocks, mainly used, many countries. (100s) þ .. 15. 45 Flat box with world (non-UK) off-paper stamps, some highly duplicated. (c.500g net) þ 15. Stamps and Collectables Auction, 1 February 2016 Page 4 Estimate. 46 British Commonwealth; bundle of about 50 unsold Buy or Bid Sale lots inc. some UK. Total upset price £600+. (100s) .. .. .. .. .. £120. 47 --; bundle of about 60 unsold Buy or Bid Sale lots inc. some UK. Total upset price £600+. (100s) .. .. .. .. .. .. .. £120. mixed periods, the modern often with sets. Also a few Hawaii. (100s) þ .. £100. 1948) then A-Z mainly odds/part sets with some light dupl. (2,500) þ .. 70.
some Japan. (100s) þ .. .. .. .. .. 60.
for sale. Much QE, some earlier, and medium duplication. (1,000s) þ .. 50.
of medium values, and a good scattering catalogued at pounds each. (100s) þ 50.
with much Guernsey, Jersey, and Isle of Man. þ .. .. .. 40.
ludes Channel Is. and I.o.M. (100s) þ .. .. .. .. 40.
with catalogue prices noted (= £100s). (100s) þ .. .. .. 40. 56 --; one full size and four small stockbooks, with mainly used odd values/part sets, inc.
much Australia. Also binder with Hagner double-side pages (c.36, as new). (100s) þ 30.
few foreign. (100s) þ .. .. .. .. .. 30.
album, and packet of FDCs and booklets. þ .. .. .. 30.
approx.1897-1960 (a few later) mint and used and with a few better. (100s) þ .. 40. St. Vincent, Straits Settlements, and Trinidad & Tobago. .. .. 35. 62 Europe; album of m. & u. Austria, Belgium, France, Netherlands, and Portugal. (c.2,100) þ 50. Denmark, and Ireland – mostly used. (1,000s) þ .. .. .. 30.
some areas completely picked, some areas of interest remain. (100s) þ .. 30. 1849-52 20c sound used with just four margins (SG 6 cat.£65). .. .. 15. 66 --; Balkans; stockbook of early to modern mint and used, and a folder of Albania etc. (c.2,600) þ .. .. .. .. .. .. 40. French Colonies, stockleaves of 1930s USSR and Estonia. (100s) þ .. 50. Palestine, Egypt and Sudan, etc. Also a few covers. Light dupl. in places. (100s) þ 40. Europe, some light duplication. (100s) þ .. .. .. .. 20. 70 --; Prangnell Liberty album from about 1960s with general mainly used colln. (c.2,500) þ 20. 71 Latin America; stockbook of Colombia (c.270) and Nicaragua (c.110), mostly used. þ 20. Stamps and Collectables Auction, 1 February 2016 Page 5 Estimate. 1958-59 (22 = 4 different). S.t.c.£160. .. .. .. .. 20.
each, these total £1,450+). (100s) þ .. .. .. .. 70. 74 Booklets; small box of world booklets, much fairly modern Commonwealth. (c.100) þ 30. 75 Thematic; Bridges; m. & u. mix in stockbook. (c.350) þ .. .. 10. 76 --; Horses; m. & u. mix in stockbook (c.250, several m.s.) plus a small folder (with approx. 35 German and other covers/cards), and others. þ .. .. .. 30. Ü --; Railway; see UK (UK Postal History). Stamps of the Sea/Butterflies of the World collns, etc. (100s) þ .. .. 50.
etc. (100+) þ .. .. .. .. .. .. 50. Bodensee steamer cachets. (100s) þ .. .. .. .. 40.
handstamps on small covers, and one mixed UK and Europe. (100s) þ .. 40. 1998 £5 note and £5 coin, and four banknotes. .. .. .. 20. 82 --; Postal Stationery; bundle of mainly unused, with USA (140), and mixed others (55). Mainly unused and quite modern. þ .. .. .. .. 10. Ü --; Shipping; see Austria. 83 Perfins; small stockbook with world mix. (c.300) þ .. .. .. 30. 84 --; three stockleaves of pre-WW2 perfins, almost all Germany. (c.150) .. 20. 85 Cinderella; flat box with various labels, fiscals, unissued, etc. (100s) þ .. 30. Ü --; see also Antigua, Faroe Islands, UK (Locals, Cinderellas). new (unused) condition. (£84.95) þ .. .. .. .. 30.
condition. (£84.95) þ .. .. .. .. .. 20.
and the GPO (Muir, 2010), and Experimental Duplex Cancellations of Scotland (1963). þ 15. Empire in Asia, London 1951. Split binding. þ .. .. .. 15.
country cat. Canada 2005. þ .. .. .. .. .. 24.
nearly all 7 or 8-strip single-sided (55). þ .. .. .. .. 10.
so of decent quality and actually peelable, though some are curled. þ .. 20.
binders, and 3 other albums. Many with labels stuck on. þ .. .. 40. 94 --; FG De-Luxe album (dark blue) with many unused pages, quite old but fine. þ 15.
individually checked, looks about right), with slipcases. Fine. þ .. .. 20. 96 --; binder with c.65 2nd-hand (mainly fine) Hagner/Prinz single-side stockleaves. þ 15. Stamps and Collectables Auction, 1 February 2016 Page 6 Estimate. with Prinz pages, loose cover pages, stockleaves, 3 stockbooks (one still wrapped), etc. þ 30.
strips plus some block sizes, and some off-cuts as well. Weight 2.08kg. þ .. 75. 21mm and 86mm) in full or part packets. Weight 0.97kg. þ .. .. 35.
mainly strips, but some block sizes, and some unusual foreign sizes. Weight c.1.16kg. þ 40. 101 --; --; small bundle of Showgard black background strips in part packets. Weight 0.44kg. þ 10. 102 --; --; selection of Lighthouse black background mounts (like Hawid) in full or part packets. A mix of cut-to-size, strips, and blocks sizes. Weight 0.54kg. þ .. .. 20. 0.29kg. þ .. .. .. .. .. .. 15.
part packets, weight 0.28kg. þ .. .. .. .. .. 15.
some block sizes. Also a few similar Prinz. Weight c.1.0kg. þ .. .. 35.
packets, mainly strips plus a few block sizes. Weight 1.59kg. þ .. .. 50.
all strips between 26mm and 100mm (mainly larger). Weight 0.21kg. þ .. 10.
contains about 140 mounts. þ .. .. .. .. .. 40.
exchangeable UK, Canada, USA, etc. Mixed condition. (c.125) þ .. .. 70. 110 Small box with fat bundle of world notes. Mixed countries and grades. (c.250+) þ 30. VF+. .. .. .. .. .. .. .. £150. Jersey (3 x £1) and England (4 x 10/-). .. .. .. .. 50. Brooke Bond 1955 Wild Flowers (first series, £85), etc. Total cat.£698. þ .. 80. 114 Seln. of Wills sets or part sets, mainly commoner. (500+) þ .. .. 20.
items) þ .. .. .. .. .. .. £260. medals inc. WW1 pair, etc. (100s) þ .. .. .. .. 75. Stamps and Collectables Auction, 1 February 2016 Page 7 Estimate. fair number in better condition. Also five foreign. (80) þ .. .. £100. unusual. (c.145) þ .. .. .. .. .. .. 40. 119 Mixed world and UK in four storage trays and loose (100s), plus a few banknotes. þ 30. 120 Sweet tin filled with loose world and UK coins. (c.9.5 kg) þ .. .. 30. 121 Seven UK proof sets, five Canada proof dollars, Canada 1980 proof set, and a few others. þ 24. 122 Cigar box of loose mixed world coins inc. some UK, c.3.4kg. (100s) þ .. 15.
in pre-1947 silver (face £8-14-6). þ .. .. .. .. £150. 124 --; proof sets for 1993, 1997, and 1998. þ .. .. .. .. 35. 125 --; Gold Coins; 1887 sovereign, about EF. ▲ .. .. .. £150. 126 --; --; 1908 sovereign, VF. ▲ .. .. .. .. .. £150. 127 --; --; 1909 sovereign, F/VF. ▲ .. .. .. .. .. £150. 128 --; --; 1910 half sovereign, F/VF. ▲ .. .. .. .. £75. and £2 piedfort (3). þ .. .. .. .. .. £200. 1757 (F). þ .. .. .. .. .. .. 50. 131 --; --; 1942 Maundy set (4), EF. þ .. .. .. .. 70. 132 Useful mix in shoebox of Scottish, British Isles, and foreign views, plus some subject cards. Very wide-ranging, and with numerous better cards. (Estimated c.500+) þ .. £240. Wales inspecting WRAF outside Usher Hall, Edinburgh, etc. (100) þ .. £100. cards, some bits of interest. Also some greetings cards. (Estimated c.1,200) þ .. 50.
scattering of older cards included. (Estimated c.2,200) þ .. .. 30. 136 Trinidad; seln. of 51 unused cards, reasonable mix, also 4 Tobago. .. .. 40. 137 Books; mix of mainly quite modern transport subjects inc. three on mail coaches. (c.13) þ 10. 1791 bound volume of these Acts. .. .. .. .. 10.
maps and plans. þ .. .. .. .. .. .. 35.
but a couple of edge knocks. þ .. .. .. .. .. 40. 141 --; 1937 Coronation silver (58mm) medallion in original box, EF. þ .. 40. 142 --; 1969 Investiture bronze gilt (57mm) medallion in original box, EF. þ .. 20.
burgh subjects), a Triang Minic racing set, etc. V .. .. .. 40. Stamps and Collectables Auction, 1 February 2016 Page 8 Estimate. 100s), modern trade cards (100s), plus some bits of model railway. þ .. 40. 145 --; seln. of banknotes in old wallet (mainly France), several modern UK coin sets, etc. þ 30.
in good used condition. (Retail £29.90) þ .. .. .. .. 10. 1937-41 set (4), all m.m., cat.£549. .. .. .. .. 70.
small faults. Barefoot cat.£65½. .. .. .. .. .. 20.
others. (42) .. .. .. .. .. .. 35.
variety of cancels (c.215 pieces). Also other used stamps (c.130) þ .. .. 40. (unusual destination). .. .. .. .. .. 10.
u.m. or m.m. (c.230) .. .. .. .. .. 70. 153 --; 1913-36 used range of ‘Roos and KG5 Heads, s.t.c.£540. (83) .. .. 24.
other better values. S.t.c.£450. (81, 1 m.s.) .. .. .. .. 50.
pencil notations on gum), SG 355-360 cat.£180. .. .. .. 50. 156 --; 1966-2001 u.m. colln. on stockleaves, fairly complete up to about 1990, less so after. Face value c.$465 (= c.£225). (100s) .. .. .. .. 70. PSEs. (c.380) þ .. .. .. .. .. .. 50.
etc. (c.570). Also some mint and SG 2010 Australia catalogue. þ .. .. 50. 159 --; 1913-75 used collection in SG printed album. (c.500) þ .. .. 40. (= c.£83+) þ .. .. .. .. .. .. 20.
two FDC albums, stockbook, club books, etc. (Many 100s) þ .. .. 50. 162 --; 1936 Dollfus 10s fine lightly mounted mint, centred partly to left. SG 793 cat.£950. £260. postcards/photographs, and a couple of documents. þ .. .. .. 40.
used on piece with cancel that appears to be dated 1941. .. .. 24. 165 Bahrain; 1933-55 mint and used small colln. on five pages inc. several medium values. S.t.c.£350. (72) .. .. .. .. .. .. 35. (13) m.m. Also a few earlier m./u. (100s) þ .. .. .. .. 30. Jubilees with SPECIMEN opts. (faults), etc. (200+) .. .. .. 30. Stamps and Collectables Auction, 1 February 2016 Page 9 Estimate. and mixed others. þ .. .. .. .. .. 15. 169 --; 1915-22 5f (inscribed “FRANKEN”) fine mounted mint, centred a little high and to left. SG 193 cat.£500. .. .. .. .. .. .. £100. 170 --; 1952 UPU Congress set (12) u.m., tone spot on one perf of 10f. SG 1398-1409 cat. c.£350. .. .. .. .. .. .. .. 75.
block u.m., and 4d fourblock f.u. Cat.£122. .. .. .. .. 30. l.m.m., 10/- l.m.m. (tiniest hinge), and 12/6 m.m. (Minimum cat.£276. for u.m.) 60. u.m.) .. .. .. .. .. .. .. 40.
pounds. þ .. .. .. .. .. .. £150. 175 --; a similar lot. þ .. .. .. .. .. .. £150. mixed m./u. S.t.c.£480. (52) .. .. .. .. .. 50. dupl.) with Japanese Occupation opts. Mainly fine m.m., s.t.c.£300+ .. 40. O23 cat.£21 each = £1,680. Sold "as is". .. .. .. .. 35. 179 --; fragile bundle of telegraph forms used about 1900s, a couple of later envelopes. þ 10. 1d opt.) l.m.m./m.m., SG B1-B9, cat.£106. .. .. .. .. 24. 8½c, 12½c, all imperf and probably proofs. .. .. .. .. 40.
fine. S.t.c.£700+ (89) .. .. .. .. .. 35.
lower margin, u.m. SG 34 (var.). .. .. .. .. 20. QV, 1903 KE7 to 50c, various KG5 and later fairly complete to about 1980. (100s) þ 50. 1911-22 set plus some coils, etc., often with extra shades. Mainly good/fine, some poorer. S.t.c.£900. (124) .. .. .. .. .. .. 50.
etc. Cat.£1,450. .. .. .. .. .. .. £100. few Officials. Mainly fine u.m., s.t.c.£400. .. .. .. .. 40.
blocks), Special Delivery, etc. Mainly u.m., s.t.c.£450. (80+) .. .. 35.
and later m. & u. on stockleaves inc. a few blocks/panes, covers. (100s) þ .. 35. Stamps and Collectables Auction, 1 February 2016 Page 10 Estimate. 192 Cayman Islands; 1938-90 mostly u.m. colln. in album (inc. some on stockleaves), inc.
1938 set (14) u.m., 1953 set (15) m.m., 1962 set (15) m.m. Also a few earlier. (100s) þ 70. 193 --; 1932 Centenary set (12) l.m.m./m.m., fine and fresh, SG 84-95 cat.£500. .. £130. (fiscal use), etc. and a few officials. (c.340) þ .. .. .. £160. adherance on 3c, and a little gum toning on 20c. SG 242-250, cat.£147. 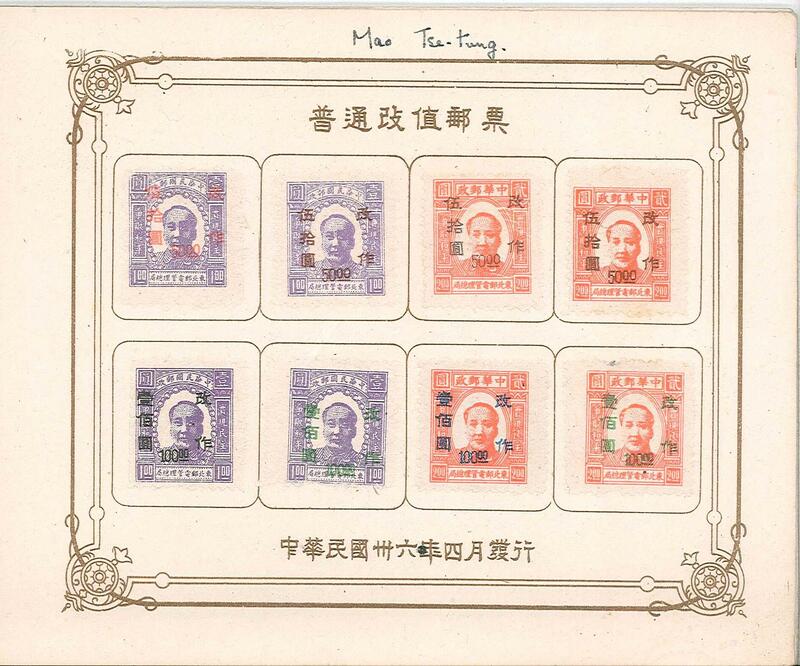 (9) .. 40.
of Chiang Kai-shek set (3), 1948 Zhaolin set (2, white paper), and a few other cheaper. inside in English (probably translations of the Chinese printed text). £200 to £300. cancel (colour run on 30pa, couple blunt perfs on 18pi). SG 40-49 cat.£325. .. 80. 198 --; 1928 Fiftieth Anniversary set (10) lightly mounted mint, SG 123-132 cat.£300. £100. u. (1), 10g m.m. (1), and 1930 1g u. (3). Mainly good/fine. Cat.£969. .. 80.
mainly c.t.o. Also some postage due and parcel posts. (100s) þ .. .. £140. size). Typically hand-written addresses to 1981, then unaddressed 1984 onwards. (c.370) þ 90.
or label addresses. (140) þ .. .. .. .. .. 20. 203 Falkland Islands; 1885-1935 largely mint seln., with QV to 4d, KE7 to 1/-, KG5 to 1/-. S.t.c.£500+ (25) .. .. .. .. .. .. 70.
to lower-right). SG60-64, 66-69, cat.£970. .. .. .. .. £180. 205 Faroe Islands; 1975-2010 u.m. colln. in Lighthouse hingeless album, apparently complete. Also 2009 sheetlet, and three booklets. (c.620) þ .. .. .. 90.
plete. (c.620, and some booklets) þ .. .. .. .. 90. 207 --; 1978-2010 colln. of unaddressed FDCs in two albums, complete from 2000 onwards. (c.200) þ .. .. .. .. .. .. 60. 208 --; Cinderella; 1976-2010 colln. of Christmas seals in u.m. complete sheets. (35) 20. 209 Fiji; 1953-90 mostly u.m. colln. in album, inc. 1954 set (15) m.m. (100s) þ .. 30. m.m.). Also 1889-94 2p (3), 1m (2), 5m, and 1895 25p m.m.,cat.£57. .. 24.
and booklet panes. (c.210) þ .. .. .. .. .. 30. 35+25c, 50+50c used, 1918 Red Cross mint (crease) and used. Mixed duplication. Stamps and Collectables Auction, 1 February 2016 Page 11 Estimate. 1859-1943. Mixed quality, many fine. (100s) .. .. .. 50.
fine but some faults. S.t.c.£580. (23 = 6 different) .. .. .. 30. 215 --; approx. 1849-1978 mainly used seln. on stockleaf, poor to fine, s.t.c.£320. (50) 12.
used (the 1c m.m, others poor to fine, though the 20c g.u., 50c small thin). S.t.c.£980. (15) 45.
with scattering of better values and some quite useful later thematics. S.t.c.£775. (c.430) þ 70.
stamps cat a few pounds each. (110 covers) þ .. .. .. 40. 1926 Air 3m m.m. Occasional slight dupl. S.t.c.£770. (55) .. .. 60. u.m., used mainly f./v.f.u. Total s.t.c.£2,118. (100s) þ .. .. .. £100. used for 1974-92 (sometimes two u.m., none used). Reasonably complete, and inc. some m.s. and booklets. (c.1,600) þ .. .. .. .. .. 50.
cancelled stamp, and FDC for each stamp) in 2 boxes (c.250 items) þ .. 40.
vols. mainly u.m., 3 vols. used). (100s) þ .. .. .. .. 40. 224 --; --; 1963-67 range of mainly u.m. sets (21 stamps are c.t.o. ), possibly complete for period. S.t.c.£350. (c.320) .. .. .. .. .. .. 30. 225 --; --; 1965-89 u.m. seln. of sets and m.s. on stockleaves, apparently all-different. S.t.c.£295. (c.395, 15 m.s.) .. .. .. .. .. .. 30.
each). þ .. .. .. .. .. .. 50. 227 --; --; a similar packet, but of c.1,000 stamps. þ .. .. .. 40.
included, inc. a little from other countries. þ .. .. .. 20. Ü --; see also Collections and Mixed Lots (Perfins). m.m. (slight gum intrusion), and 5m f.u. (couple of short perfs). SG 30-32 cat.£630. 50. 230 Gibraltar; ten UK QV stamps each with “A26” cancel. .. .. .. 30. 231 --; 1889-1951 small m.m. & u. colln. on pages inc. several KG6 perfs etc. S.t.c.£440. (70) 26. 232 --; 1974-98 seln. of 15 m.s. and 1 bkt. pane u.m., and one m.s. used, cat.£49. .. 10.
dues (2 m.m. sets, a few poorer, and used part set on pieces with 1/- missing but extra 1/6). (c.110, 6 covers) þ .. .. .. .. .. .. £120. 234 Gilbert and Ellice Islands/Kiribati; 1953-90 mostly u.m. colln. in album. (100s) þ 20. “Greece”, 1934 Stadium, and 1935 Restoration set (5), all fine m.m. Cat.£936. 90.
all u.m., SG 692, 695, 696, cat.£304. .. .. .. .. 40. Stamps and Collectables Auction, 1 February 2016 Page 12 Estimate. P11B cat.£78. .. .. .. .. .. .. 15.
from many locations. (c.400) þ .. .. .. .. .. 60. SG 2007 catalogue, etc. þ .. .. .. .. .. 50. 1950-54 set (13) l.m.m./u.m., etc. (100s) þ .. .. .. .. £260. (= c.£135), plus 40 NVIs. .. .. .. .. .. 70.
cards, and a few envelopes. (Estimated c.600) þ .. .. .. 30. 243 India; Officials; 1883-99 8a dull mauve mint block of six (all but one u.m.). SG O45 (cat. £252 for m.m.). .. .. .. .. .. .. 40.
unused (large part gum, heavily mounted). SG 90-92 cat.£681, but sold “as is”. 50. Wilhemina opts. All mint, mixed u.m./m.m., s.t.c.£550+ .. .. 45. “as is”. .. .. .. .. .. .. .. 20.
cated on-paper, and a bag with about 500 commems on-paper. þ .. .. 20.
poor to fine used. (230) þ .. .. .. .. .. 30. (but very light marks on face of stamp), others without gum (and odd short perfs etc.). (Cat. £2,539 for m.m.) .. .. .. .. .. .. 60. (l.m.m. ), 1950 UNESCO set, Holy Year set, all u.m. but for two. Cat.£1,297. .. 80. 251 Jamaica; 1956-90 mostly u.m. colln. in album, plus some earlier m./u. (100s) þ 30.
is m.m. and fine, lower pair is u.m. but one is rubbed and holed. SG F5b, cat.£260. 30. 253 Jordan; 1930-77 m.m. and used colln. in album. Also p.dues 1923-52. (c.650) þ 30.
values. S.t.c.£870. (100s) .. .. .. .. .. 40. 1883-91 set (9, plus dupl. ), 1892-99 set (11) u., etc. Mixed condition, from poor to fine. S.t.c.£2,600+ (119) .. .. .. .. .. .. £120. 256 --; 1867-1936 collection on a few pages, majority used, with good overall coverage. (dubious cancel), 1906-12 mainly u., to $5, and mixed KG5. (c.140) .. 80.
some duplicates (a few with fiscal cancels). S.t.c. approx. £1,400+ Varied condition. (72) 70. Stamps and Collectables Auction, 1 February 2016 Page 13 Estimate. 258 Straits Settlements; 1906-7 overprints on Labuan set (11) m.m./unused, most with gum. Spots on 4c/12c and 8c. SG 141-151 cat.£375. .. .. .. 40. 259 --; 1912-41 KG5/KG6 mainly used on pages, s.t.c.£880. (131) .. .. 50. 260 --; 1936-37 2c to 40c m.m. (cat.£19½), and 1937-41 die I 1c to 6c, 10c to 40c all m.m. (cat.£217. for u.m.). (20) .. .. .. .. .. 20.
poorer. S.t.c.£1,200 (the “Elephants” having been counted at 10%). (140) .. 75. 1 cover) .. .. .. .. .. .. .. 20.
thin at corner, 50c creased, $2 greasy mark but also crown to left, $3 centred to upper-left). Cat. c.£240. (15) .. .. .. .. .. .. 40. 30c m.m.). SG 76-90 cat.£160. .. .. .. .. .. 35.
fine mounted (the 10c fine l.m.m., 30c shade fine m.m., first $1 fine m.m., second $1 l.m.m. with wrinkle, $25 fine but with some interleaving adherence on gum). SG 1-12, cat.£250+ 50.
plus extra $1 u. (poorer), and 1951-55 odd values used. Cat.£355. .. .. 50. 267 Negri Sembilan; 1891-1963 mint and used on a few pages inc. 1891-94 set (3) both m.m. and used, 1895-99 set (10) mixed m.m., 1898-1900 the five 4c surcharges mainly used, etc. Cat.£675+ (58) .. .. .. .. .. .. 80.
etc. (46) .. .. .. .. .. .. .. 30. $5 perf) l.m.m., four PGS opts., etc. Cat. c.£600+ (171) .. .. .. 70. 270 --; 1895-99 Tiger set 1c to both 50c m.m. (3c, 25c, and first 50c no gum, second 50c m.m. with heavy mount). SG 66-75 cat.£600. .. .. .. .. 50.
for u.m.) (17) .. .. .. .. .. .. 60. m.m., 1935-41 set (18) mixed u., 1949-55 set (21) used. (87) .. .. 35.
mainly fine (1891-94 both 2c used damaged). SG 50-55 cat.£120. .. .. 30. 274 Malta; early to modern m. & u. in stockalbum with dupl., some slightly better. (100s) þ 15.
surcharge 1d (2), all m.m., mainly fine. Also 1886 5/- used (rough at one side). S.t.c.£530. (18) .. .. .. .. .. .. .. 60. 276 --; 1885-1989 m. & u. colln. in album. (c.380) þ .. .. .. 15. Stamps and Collectables Auction, 1 February 2016 Page 14 Estimate. set to 1/-, all m.m. S.t.c. £490. (34) .. .. .. .. 80.
g.u. (one short perf, £180). .. .. .. .. .. 30.
with small colln. of Neth. Indies, Indonesia, Antilles. (c.135) þ .. .. 12. 2/-, plus Official 1925-31 set (9), all m.m. Cat.£234. .. .. .. 40. (2), 76, 77, 93, 108, and 119 (2), not individually checked by us, but probably not far out. S.t.c.£1,750. Mixed grades. .. .. .. .. .. 40.
both m. & u., slight duplication. S.t.c.£1,650. þ .. .. .. 50.
territories), others in packets. þ .. .. .. .. .. 40.
folder with a few Health issues. (100s) þ .. .. .. .. 30. Official opts. S.t.c.£530., mainly fair/fine. (73) .. .. .. 24.
four varieties, etc. .. .. .. .. .. .. 8. 287 --; SG One-Country-Album (2 vols., pages to 1997) with moderate used colln. (c.500) þ 30.
issues for the period, inc. Tokelau. (Stamps cat.£149) .. .. .. 30. 289 --; year books for 1984, 1985, 1990, 1991, 1992, and 1993. Face value $227+ (= c.£103) þ 30.
various extras), etc. S.t.c.£520. (131) .. .. .. .. 40. 291 Northern Nigeria; 1900-07 fair to fine m.m. seln. inc. 1905-7 short set to 5d plus 2/6. S.t.c.£310. (15) .. .. .. .. .. .. 40. 1/- each overprinted SPECIMEN and hinged. .. .. .. .. 40. 1/- m.m., other medium values. S.t.c.£420. (39) .. .. .. 45.
in packets, and a shoebox of stamps/covers/postcards. (1,000s) þ .. .. 60. 295 --; two stockbooks, plus mixed pages and small stockbook of mint and used. (100s) þ 30. 296 Rhodesia; 1910-13 largely used seln. of Double Heads to 2/-, but some in poorer quality. S.t.c.£800. (28) .. .. .. .. .. .. 45.
different m./u. from 1879 and 1884 sets. .. .. .. .. 40. 298 Rwanda; c.1962-84 mainly m.m. colln. on pages (c.360). Also four Zambia FDCs. 10.
used. Cat.£616. .. .. .. .. .. .. 60.
watermark at top, couple of blunt perfs. SG 16a cat.£550. .. .. 60. 301 --; 1864-80 6d wmk. Crown CC, perf.14 fine m.m., some very minor tone spots. SG 29 cat. £550. .. .. .. .. .. .. .. 50. PLEASE USED FIRST CLASS POST – DON’T MISS A BID FOR NINEPENCE ! Stamps and Collectables Auction, 1 February 2016 Page 15 Estimate. opt., unmounted. (Cat.£300 for full set of 7) .. .. .. .. 50.
foot. SG 105c cat.£180. .. .. .. .. .. 22. 304 --; 1934 Centenary set (10) fine and fresh l.m.m./m.m., SG 114-123 cat.£425. .. £120. 305 Saint Kitts-Nevis; 1903 set (10) m.m., SG 1-10 cat.£130. .. .. 30. 50c). SG 8-21 cat.£600. .. .. .. .. .. 40. 307 Somaliland; 1938 ½a to 12a (missing 3a) in u.m. fourblocks (the 6a poorer). Cat.£228. 30.
are 3-margin, and inc. fine). Later issues m. & u., and five covers. þ .. £200. 309 --; --; 1902-4 KE7 short set to 1/- m.m. (½d no gum, 4d short corner). Cat.£114. 20.
sixblock (2 x 3), all used, mainly good/fine though a few faults. Cat.£673. .. 40.
as 3-strip) all mint (m.m./l.m.m. ), mainly fine. S.t.c.£610. .. .. 70.
cates, mainly fine m.m./l.m.m. S.t.c.£873. .. .. .. .. £100. etc. Includes some SWA. (1,000s) þ .. .. .. .. 15.
to 75p catalogue bracket. (Many 1,000s) þ .. .. .. .. £100. dupl. in places. (c.210) þ .. .. .. .. .. 30. 316 Switzerland; 1854-2009 used colln. of defins and commems in Davo printed album. 1959 onwards. (100s) þ .. .. .. .. .. 80. Helvetias imperf (15), perf (25), and mixed later with many commems 1945-93. Light dupl. Also some League of Nations/UN. (100s) þ .. .. .. 50. 318 --; packet of c.500+ used charity stamps on piece. þ .. .. .. 20. 319 Togo; 1937-97 mint and used on stockleaves, some complete sets, much c.t.o. (c.300) 12.
album leaves 1956-84. (100s) þ .. .. .. .. 35. 321 --; 1865-1959 (approx.) dupl. m. & u. ranges inc. SG 101 (5pa lilac, no gum, thinned, cat. £150. for m.m.). Others s.t.c.£568. (c.480) .. .. .. .. 20.
this variety not listed. .. .. .. .. 20.
ships, etc. Also a few other countries (inc. USA 1931 Trans-Arctic Submarine Expedition). (c.270) þ .. .. .. .. .. .. 40. 324 --; 1929-95 mint (mainly u.m.) seln. with dupl. up to x6, also inc. a few modern Georgia. S.t.c.£175. (75) .. .. .. .. .. .. 15. Ü --; see also Russian POs. 325 Zululand; 1888-93 5d m.m. Fine from front, some marks on gum. SG 7 cat.£100. 10. Stamps and Collectables Auction, 1 February 2016 Page 16 Estimate. small thin and nick at top). .. .. .. .. .. 70.
appearance 3½ margin (with other faults). .. .. .. .. 75. Ü 1840 penny black; see also UK Postal History. average cancel). .. .. .. .. .. .. 80.
a weak print of Die II (SG 21Wi, cat.£1,750). .. .. .. 75.
mixed condition. (160) .. .. .. .. .. 20. 331 1858-79 collection of Penny Red plates – appears to be a complete run except 77 and 225.
mainly sound/good/fine used (150). Also plate 83 with inverted wmk. g.u. .. 90.
forated at right, some others with a few short perfs in places. Cat.£1,650. .. 40.
mixed cancels, and some perf faults. Cat.£2,065. .. .. .. 60. “mint”). .. .. .. .. .. .. .. 20.
perfs but for a couple of shortened tips, strong colour, fresh gum. SG 211 cat.£4,000. £900. issues). Cat.£274. (88) .. .. .. .. .. 40.
sepia, 5d, 1967 Radar 4d, Christmas 3d, 1968 Paintings 4d, 1/-, 1/6. (Cat.£38 for u.m.) 12. 338 2012 Olympics Gold Medal Winners set of 29 sheetlets of six u.m. Face value £109. 70. 339 Booklets; 1988-90 seln. of 12 different barcode booklets. Face value £31.44. .. 26.
at right, and some of original sheet edge markings at foot). Small blemish on cover. 30.
run, plus four earlier, some of these in Royal Mail album. Face value c.£340. þ £200. 342 Presentation Packs; 1984 and 1985 Royal Mail Year Books, cat.£85 and £75. þ 24.
country issues. Face value c.£770. (c.150) Also Reproduction Pack of 1948 Olympics. þ £480. 1994 pack and China 2009 year book. þ .. .. .. .. £260. c.£320. (c.90) þ .. .. .. .. .. .. £190. 1967-79 and two 2011 Penny Red repro packs. Decimal face value c.£280. (c.160) þ £160. face c.£38. þ .. .. .. .. .. .. £120. 348 --; 1967-2000 loose in box (c.160, face value c.£90). Also some booklets and PSBs (f.v. c.£42) þ .. .. .. .. .. .. 80. Phoning for results ? Note that our shop does not open until noon on a Tuesday, and we do not normally answer the phone on the day after the auction until after that time. Stamps and Collectables Auction, 1 February 2016 Page 17 Estimate. 349 UK Postage Material; mint commems, defins, country issues, much in blocks, plus pres. c.£1,580. [NB carries tobacco smell] þ .. .. .. .. £950. stockbook of u.m. decimal commems 1972-2000. Face value c.£665. þ .. £400. 351 --; loose decimals, and two albums of pres.packs. Face c.£345. þ .. .. £200. 352 --; 1971-94 in album, stockbook, and loose. Face value c.£320. þ .. .. £190. 353 --; seln. of decimal mint blocks, coil strips, etc. Face value c.£150. þ .. 90. 354 --; Millenium collection of presentation packs, other p.packs and loose stamps, face c.£115. Also c.40 unused airletters face c.£12.60. þ .. .. .. 75. 355 --; 1999-2007 miniature sheets (21) and other mint decimal inc. booklets. Face £107. þ 65. £75 each), Wildlife (2), Christmas (2), 1978 Energy (1), Buildings (1), Buildings m.s. (4). 80.
sheets, etc. .. .. .. .. .. .. 30.
these cancels are thought “linked”. Nearly all fine. (c.410) þ .. .. £400. mostly with alternative cancels. (c.140) þ .. .. .. .. £220. full sets) 1958 Games (illus, Cardiff slogan, handwritten), 1960 GLO (illus, Lombard St.
stamps inside. Some of loose covers are damaged. (100s) þ .. .. £100. covers (24). þ .. .. .. .. .. .. £100. (bureau and alternative pmks.) (c.415). Also small album of mostly 1960s FDCs etc. þ 50.
standard PO covers with alternative cancels. (c.100) þ .. .. .. 50. 364 --; 1966-2000 (with a few later) in 4 cover albums, mostly standard Bureau covers. (c.290) þ 40. 365 --; 1957-84 in album and loose with some dupl. and inc. some special event covers. (c.540). Also 1977 Jubilee Tour covers (24). Some toning. þ .. .. .. 40. 366 --; 1969-92 colln. in four albums, the large majority standard PO covers. (260) .. 30.
plus a few maxi cards, special events, some others. (c.250) þ .. .. 30.
c.500) þ .. .. .. .. .. .. 30. 369 Philatelic Numismatic Covers; 1986-2007 colln. of Royal Mail/Royal Mint covers inc.
2008 Commonwealth Games (4 x £2). Coin face value £102. (39) þ .. £120. 370 PHQ Postcards; 1973-79 used (first day cancels, stamps on reverse) colln. in album inc.
ally very fine unaddressed. (c.130) þ .. .. .. .. £150. 371 --; 1980-2002 used (first day) collection in six postcard albums, fairly complete. (c.920) þ 60. Stamps and Collectables Auction, 1 February 2016 Page 18 Estimate. left corner, cover folded vertically at centre. .. .. .. .. 60. 373 --; 1840 (20 Oct.) cover Penrith to Ludlow with penny black SL plate 6 tied by red MC. Stamp has 3½ margins, cover with only small faults. .. .. .. 50.
of 1972-85 TPO covers (c.100), and a piece of “Royal Train” notepaper and envelope. þ 40. Guernsey 1958-1992 (1 album, £90), and a mixed box of loose, mostly later. (100s) þ £140. 376 --; packet of c.500 pictorials used on piece. .. .. .. .. 10.
from PO, some p.packs, etc. (100s) þ .. .. .. .. 40. Lundy 29 JA 12 c.d.s., Lundy catalogue (2009 edition), and small stockbook of world. þ 40. 379 --; Lundy, Herm, etc. mint and used on stockleaves. Also a few covers. (100s) .. 24. 380 UK Cinderellas; packet of railway parcel stamps (c.80, mixed condition), and others. þ 30. Victorian Steam Railway stamps and cover. (1 m.s., 2 stamps, 1 cover). .. 20. 382 --; 1890s Scottish Sunday School labels in small s/book inc. some pairs/blocks. (c.225) þ 20.
fine. S.t.c. c.£10,000. (c.240) .. .. .. .. .. £300. some greetings) and defins. Face value c.£200. þ .. .. .. £120. things worth a few pence up to a pound or two. (1,000s) þ .. .. £100. vals. set (6) mixed u., 1948 S.Wedding fair u., some QE Wildings, etc. (100s) þ 80.
in u.m. blocks etc. Some dupl. (1,000s) þ .. .. .. .. 70.
and overprints on UK (Morocco Agencies, Levant, MEF, etc.) (c.350). þ .. 60. Red imperf fair m.m., 1948 S.Wedding £1 u.m., etc., and a few covers. þ .. 50.
packets. (1,000s) þ .. .. .. .. .. .. 50.
plus some duplication. Includes 1967 Christmas 3d missing phosphor block of twenty. Mainly fine u.m. (c.150 blocks) þ .. .. .. .. 40. Stamps and Collectables Auction, 1 February 2016 Page 19 Estimate. 393 United Kingdom Collections and Mixed Lots; box with sparse UK colln. which inc.
covers. Also 2-volume commem album with used 1924-90. (100s) þ .. 40. UK pre-decimal mint, various Channel I. & I.o.M. inc. Jersey 1943 3d block of 20 u.m., etc. Plot commem sheet with House of Lords cancels, a signed portrait of Tony Blair, etc. þ 30.
phosphors, etc. ; and a folder with some mint blocks, etc. þ .. .. 24. FDCs). þ .. .. .. .. .. .. 20.
marks, and small box of empty modern booklet covers. Also 2 boxes of non-UK slogans. V 15. €uro Currency; We are happy to accept Euro cash payments in our shop. We normally allow the market rate rounded down to the next whole penny. For example, at the time of writing, the market rate is 0.7685, so we are allowing 76p per Euro (which is probably better than your bank will give you). You can also pay for lots in this auction by Euro banknotes (postal customers please confirm before sending). We also accept payments in our shop in Euros, and we buy the old “legacy” currencies, as well as other coins and notes. Thursday 28thth January, Friday 29th January, and Saturday 30th January 10am-6pm each day. Larger lots (marked “þ” in the description); on view at auction venue from 3pm: Smaller lots; on view by 4.00pm. Viewing will end at about 6.50pm. Stamps and Collectables Auction, 1 February 2016 Page 20 . 1 90. 2 130. 3 95. 4 160. 5 110. 6 75. 7 85. 8 75. 9 95. 10 75. 11 65. 12 80. 13 85. 14 95. 15 75. 16 65. 17 60. 18 35. 19 - 20 42. 21 20. 22 65. 23 20. 24 20. 25 38. 26 32. 27 40. 28 32. 29 55. 30 120. 31 30. 32 30. 33 40. 34 14. 35 26. 36 26. 37 35. 38 32. 39 24. 40 10. 41 900. 42 170. 43 120. 44 110. 45 80. 46 40. 47 42. 48 85. 49 50. 50 55. 51 95. 52 110. 53 24. 54 70. 55 80. 56 - 57 28. 58 500. 59 35. 60 80. 61 10. 62 28. 63 24. 64 35. 65 150. 66 45. 67 26. 68 14. 69 24. 70 35. 71 26. 72 9. 73 26. 74 55. 75 32. 76 19. 77 30. 78 50. 79 - 80 10. 81 35. 82 95. 83 75. 84 80. 85 42. 86 15. 87 - 88 42. 89 160. 90 85. 101 - 102 48. 103 60. 104 65. 105 45. 106 85. 107 14. 108 28. 109 65. 110 50. 121 160. 122 55. 123 380. 124 26. 125 55. 126 55. 127 120. 128 35. 129 90. 130 35. 131 35. 132 100. 133 90. 134 130. 135 32. 136 30. 137 55. 138 26. 139 150. 140 22. 141 320. 142 26. 143 80. 144 60. 145 45. 146 48. 147 26. 148 65. 149 28. 150 55. 151 38. 152 18. 153 55. 154 22. 155 110. 156 42. 157 260. 158 26. 159 26. 160 50. 161 20. 162 30. 163 28. 164 120. 165 60. 166 50. 167 200. 168 220. 169 50. 170 65. 171 14. 172 40. 173 42. 174 26. 175 70. 176 35. 177 14. 178 160. 179 26. 180 35. 181 28. 182 20. 183 180. 184 60. 185 70. 186 40. 187 42. 188 60. 189 35. 190 20. 191 70. 192 35. 193 100. 194 40. 195 55. 196 14. 197 180. 198 32. 199 85. 200 65. 201 65. 202 90. 203 65. 204 42. 205 32. 206 60. 207 35. 208 48. 209 70. 210 110. 211 80. 212 90. 213 45. 214 24. 215 70. 216 28. 217 45. 218 55. 219 60. 220 120. 221 60. 222 80. 223 42. 224 30. 225 28. 226 35. 227 40. 228 20. 229 26. 230 90. 241 35. 242 65. 243 22. 244 70. 245 55. 246 280. 247 30. 248 160. 249 95. 250 40. 251 40. 252 140. 253 50. 254 100. 255 95. 256 60. 257 80. 258 50. 259 45. 260 48. 261 40. 262 130. 263 80. 264 60. 265 35. 266 750. 267 35. 268 35. 269 26. 270 60. 271 80. 272 60. 273 55. 274 40. 275 80. 276 35. 277 26. 278 280. 279 65. 280 200. 291 70. 292 48. 293 220. 294 48. 295 26. 296 200. 297 100. 298 120. 299 850. 300 380. 301 320. 302 300. 303 380. 304 42. 305 150. 306 80. 307 80. 308 48. 309 130. 310 700. 311 45. 312 45. 313 42. 314 110. 315 200. 316 80. 317 15. 318 16. 319 1400. 320 260. 321 90. 322 48. 323 26. 324 22. 325 220. 326 120. 327 65. 328 18. 329 80. 330 32. 331 10. 332 150. 333 120. 334 60. 335 60. 336 35. 337 20. 338 240. 339 60. 340 40. 341 120. 342 50. 343 150. 344 60. 345 80. 346 50. 347 - 348 14. 349 22. 350 42. 351 800. 352 700. 353 1100. 354 700. 355 750. 356 280. 357 140. 358 100. 359 120. 360 90. 361 65. 362 60. 363 60. 364 70. 365 40. 366 50. 367 60. 368 35. 369 26. 370 30. 391 - 392 - 393 - 394 - 395 130. 396 80. 397 26. 398 40. 399 22. 400 26. 401 14. 402 - 403 26. 404 20. 405 35. 406 14. 407 65. 408 40. 409 50. 410 35. 411 24. 412 17. 413 100. 414 350. 415 300. 416 65. 417 150. 418 150. 419 150. 420 32. 421 22. 422 50. 423 38. 424 28. 425 55. 426 40. 427 130. 428 150. 429 130. 430 100. 431 240. 432 400. 433 130. 434 40. 435 600. 436 35. 437 30. 438 380. 439 110. 440 150. 441 55. 442 100. 443 150. 444 190. 445 20. 446 90. 447 42. 448 32. 449 350. 450 48. 451 38. 452 28. 453 20. 454 26. 455 26. 456 75. 457 65. 458 40. 459 70. 460 70. 461 60. 462 42. 463 48. 464 85. 465 1200. 466 95. 467 - 468 38. 469 38. 470 30. 471 40. 472 45. 473 85. 474 26. 475 20. 476 180. 477 75. 478 65. 479 40. 480 45. 481 35. 482 7. 483 13. 484 28. 485 30. 486 380. 487 140. 488 22. 489 16. 490 7. 491 15. 492 - 493 - 494 220. e. & o. e.
Of course these books are also available to shop customers (though prices are sometimes different due to Amazon’s “aggregate price plus postage” policy !). FORTHCOMING AUCTIONS; Our next auction is planned for 21 March 2016. Material can be accepted at any time for inclusion in future sales. Our commission is 12% of the sale price, plus administration fee of £1.50 per lot + £6.50 per vendor (all plus v.a.t.). Full details on request. Minimum charge £12 per vendor in one auction (£10 plus vat). The annual subscription for our auction catalogues (paper copy) is currently £9 for inland UK addresses. If you are not already on our mailing list, please send us £9 with a note of your name and address. Regular bidders and buyers may qualify for free renewal. Rates abroad are Europe £12, overseas £15.